It is a very large book and actually looks like a encyclopedia. Leaving aside the price, which seems much too high (though it is unfortunately not out of line with academic publishers who aim their works primarily at libraries, not at readers), this is a book that nonetheless contains quite a lot of interesting entries. Most of the important Tolkien scholars are represented here (except Wayne Hammond and Christina Scull), and those whom you have come to know and trust do not disappoint in their articles, which make for important reading. The most important contributors are Tom Shippey, Verlyn Flieger, Douglas Anderson, Marjorie Burns, among others. 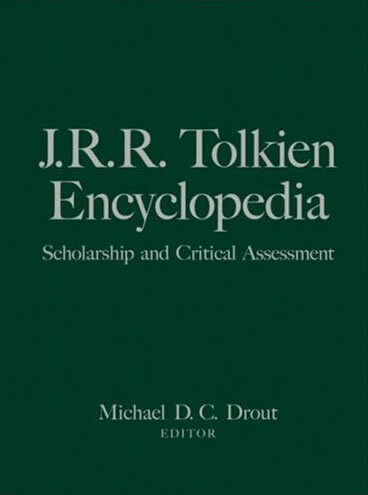 Coverage not only presents the most recent scholarship on J. R. R. Tolkien, but also introduces and explores the author and scholar's life and work within their historical and cultural contexts. Tolkien's fiction and his sources of influence are examined along with his artistic and academic achievements- including his translations of medieval texts- teaching posts, linguistic works, and the languages he created. Unfortunately, there are some very strange articles, for example the one on "Missions from Anglo-Saxon England" that, while no doubt entirely accurate in its contents, makes even not one mention of Tolkien (or his works), and seems entirely unconnected with the titular purpose of this Encyclopedia. Some of the entries on characters and places in Tolkien's work read like entries for a Foster's Guide to Middle-earth rather than for a Tolkien encyclopedia, starting out describing their place in the sub-creation (i.e. as if they were real) and only later getting to their role as fictional creations. This would be less irritating if the entries written this way didn't also fail to say where the sub-creational information on them comes from. I know, and you know, but prospective readers of the encyclopedia don't. The greatest flaws of this work are the unevenness of its contributions, and the large number of editing and typographical errors. Also there are some double entries and a lot of very important entries missing. It makes me wonder if anybody did edit this book at all. Needless to say, such flaws as remain in the published work do not redound to the glory of Routledge as an academic publisher. You can read the story of the imperfections, which explains a lot why the book is not what it was actually meant to be, on Drout's blog. There we can also read that Taylor and Francis has only printed 800 copies of the Encyclopedia rather than the planned 2,500. So if you are a Tolkien book collector and have $175.00 and a real interest in Tolkien, you should check it out. Although there are some imperfections (to say the least) I think it is a very useful resource for people interested in Tolkien at all levels. But especially collectors will be interested to obtain a volume.